Mike Greene - mgreene@shawmedia.com Paula Gartner (left), of Twin Lakes, explains the quilt at the Walkin' Webers' campsite, which honors relatives and friends touched by cancer, to Chiara Feijoo, of Round Lake, during the 13th annual Relay for Life of North McHenry Saturday, June 23, 2012 at Albert A Adams Township Park in Johnsburg. This years' event raised over $50,000 in donations from 40 teams with over 300 participants. The theme for the event was "Relay around the world" as well as a focus on why you relay with survivors wearing purple t-shirts. Mike Greene - mgreene@shawmedia.com Sheila Hansen, of Woodstock, receives a flower while being recognized as a cancer survivor during the 13th annual Relay for Life of North McHenry Saturday, June 23, 2012 at Albert A Adams Township Park in Johnsburg. This years' event raised over $50,000 in donations from 40 teams with over 300 participants. 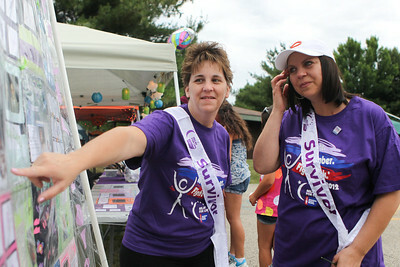 Mike Greene - mgreene@shawmedia.com Cancer survivors received sashes and purple shirts in honor of their battles at the 13th annual Relay for Life of North McHenry Saturday, June 23, 2012 at Albert A Adams Township Park in Johnsburg. This years' event raised over $50,000 in donations from 40 teams with over 300 participants. 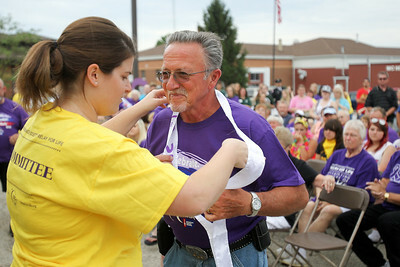 Mike Greene - mgreene@shawmedia.com Cancer survivor Jessica Bertulis, 16 of Johnsburg, receives a gift during the 13th annual Relay for Life of North McHenry Saturday, June 23, 2012 at Albert A Adams Township Park in Johnsburg. This years' event raised over $50,000 in donations from 40 teams with over 300 participants. 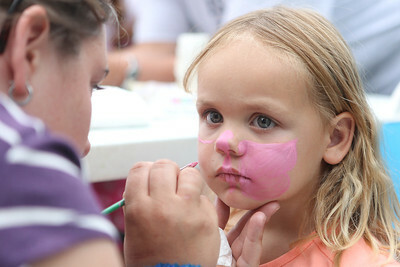 Mike Greene - mgreene@shawmedia.com Audra Schillaci, of McHenry, paints a design on the face of Hope Klosowicz, 4 of Johnsburg, during the 13th annual Relay for Life of North McHenry Saturday, June 23, 2012 at Albert A Adams Township Park in Johnsburg. This years' event raised over $50,000 in donations from 40 teams with over 300 participants. 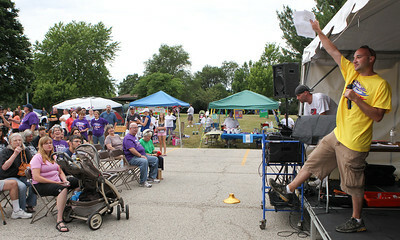 Mike Greene - mgreene@shawmedia.com Event chairman Jerry Schillaci pumps up the crowd at the start of the 13th annual Relay for Life of North McHenry Saturday, June 23, 2012 at Albert A Adams Township Park in Johnsburg. This years' event raised over $50,000 in donations from 40 teams with over 300 participants. 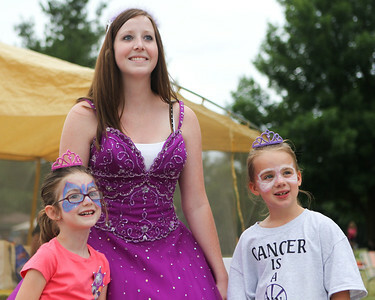 Mike Greene - mgreene@shawmedia.com Mackenzie Ruiz (left), 6 of McHenry, and Brooke Klowowicz, 7 of Johnsburg, pose for a photo with "Princess" Laura Laine, of Johnsburg, during the 13th annual Relay for Life of North McHenry Saturday, June 23, 2012 at Albert A Adams Township Park in Johnsburg. Laine's group raised money with the photos and helped the event to raise over $50,000 in donations from 40 teams with over 300 participants. 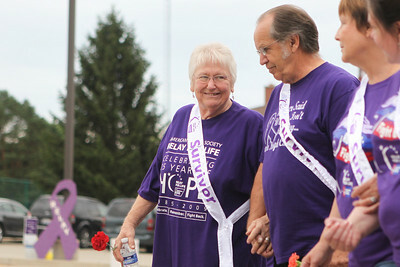 Mike Greene - mgreene@shawmedia.com Cancer survivor Diane Rasbaugh, of Spring Grove, smiles while holding hands with her husband Dave, also a cancer survivor, during the 13th annual Relay for Life of North McHenry Saturday, June 23, 2012 at Albert A Adams Township Park in Johnsburg. This years' event raised over $50,000 in donations from 40 teams with over 300 participants. 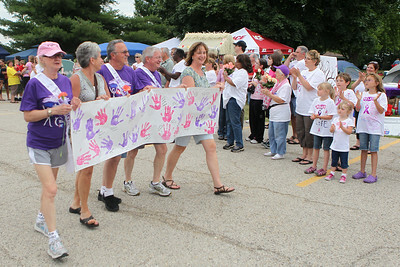 Mike Greene - mgreene@shawmedia.com Cancer survivors walk the first lap of the 13th annual Relay for Life of North McHenry Saturday, June 23, 2012 at Albert A Adams Township Park in Johnsburg. This years' event raised over $50,000 in donations from 40 teams with over 300 participants. 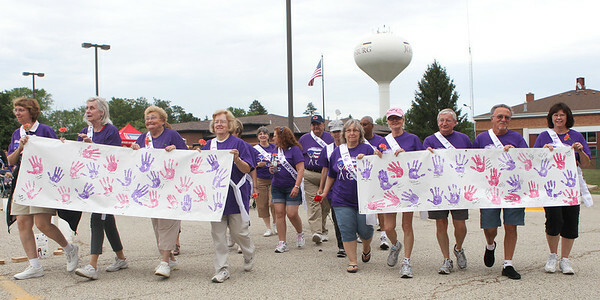 Mike Greene - mgreene@shawmedia.com Cancer survivors walk the first lap of the 13th annual Relay for Life of North McHenry as fellow participants cheer on Saturday, June 23, 2012 at Albert A Adams Township Park in Johnsburg. This years' event raised over $50,000 in donations from 40 teams with over 300 participants. 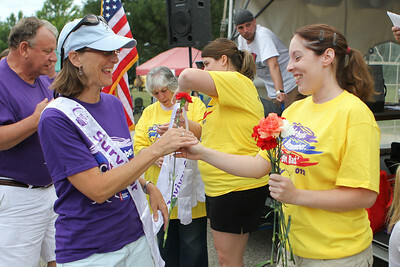 Sheila Hansen, of Woodstock, receives a flower while being recognized as a cancer survivor during the 13th annual Relay for Life of North McHenry Saturday, June 23, 2012 at Albert A Adams Township Park in Johnsburg. This years' event raised over $50,000 in donations from 40 teams with over 300 participants.